In 1984, Dodge kicked off the modern minivan revolution with the Caravan, which proved popular with family-oriented buyers right out of the gate. The boxy front-wheel-drive vehicle, which drew its inspiration from passenger vans of the 1960s and '70s, such as the VW Microbus, featured a dressed-up body style and handling designed to be more car-like than truck-like. 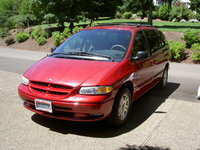 Building on the Caravan's success, Dodge unveiled the Grand Caravan three years later, in 1987. It sat on an extended wheelbase, which at 119.3 inches was 7 inches longer than the Caravan's, and measured 195 inches in overall length. With three rows of seats, the Grand Caravan offered seating for up to seven passengers, as well as a larger cargo area, meeting the needs of busy families. Lee Iacocca, who headed Dodge from the late 1970s into the early '90s, developed the concept for a minivan in the early 1970s while working at Ford, but it wasn't until he moved to Dodge/Chrysler that he was able to make his idea a reality. The original Caravan was derived primarily from the automaker's K-Cars, although it sat on an S platform rather than a K platform. 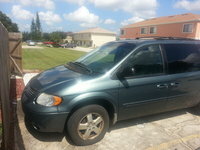 Both the Caravan and Grand Caravan were also sold under the Plymouth Voyager brand. 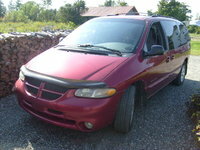 Within a few years, the Caravan/Grand Caravan/Voyager would become the most successful vehicle in Dodge's history. Through the years, Dodge equipped the Caravan/Grand Caravan with a number of innovations, including optional AWD, driver's-side front airbags, and dual sliding doors. (Early models had a sliding door only on the passenger side.) 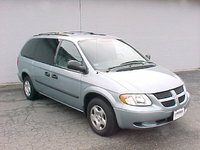 As the popularity of minivans grew, Dodge manufactured and sold the Caravan and Grand Caravan worldwide. Variants included the Chrysler Town & Country and the Volkswagen Routan. 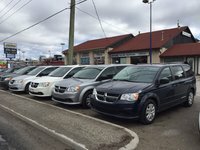 After the 2007 model year, Dodge dropped the Caravan from the lineup, but the Grand Caravan soldiers on. Recent reports indicate Dodge will continue to manufacture the Grand Caravan for at least the next few years, into the middle part of the decade. Currently in its fifth generation, the Grand Caravan receives a mid-generation refresh for 2011, which includes an updated suspension designed to provide more responsive handling, as well as a new 3.6-liter Pentastar V6 putting out 283 hp and 260 lb-ft of torque. The V6, which connects to a six-speed automatic transmission, becomes the sole powerplant offered in the Grand Caravan, replacing a pair of V6 engines. The new V6 features a driver-selectable Fuel Economizer Mode, which alters the transmission's shift points to ensure optimal fuel economy. The Grand Caravan also sits lower, rides on low-resistance tires, and sports a new rear spoiler, all designed to maximize fuel efficiency. New exterior features include a new hood, quad headlights, and Dodge's new signature split-crosshair grille, as well as more sculpted lines and "ring-of-fire" taillights. Inside, updates include a new single-piece dashboard, redesigned gauges, and improved ergonomics. In addition, Dodge offers a new optional super-center console, which provides more versatility and storage space. 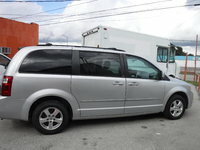 New Grand Caravan trims for 2011 include the Express, Mainstreet, Crew, and R/T, which the automaker calls the "Man Van." 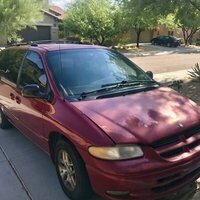 While the Grand Caravan receives positive comments for its affordability and storage capabilities, and has often led the way when it comes to standard features, it has routinely lagged in the performance category, and has fallen short on build quality, resulting in a spotty repair history. In addition, some owners find the quality of the interior materials lacking, especially when compared to the interiors from some competitive vehicles, such as the Honda Odyssey, Toyota Sienna, and Kia Sedona. 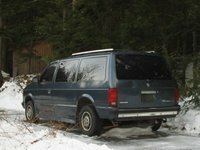 When the Dodge Grand Caravan arrived in showrooms in 1987, it sat on a 119-inch wheelbase, with an overall length of 190.5 inches and a height of just 65 inches. The low height, in particular, helped define the new Grand Caravan, since its roof sat more than a foot lower than many typical vans of the era, creating a more car-like ride height and enabling the vehicle to slip into spaces with low roofs. The low roof height was a result of the configuration of the Grand Caravan's engines and drivetrain. The minivan's two available engines were mounted transversely in the chassis and drove the front wheels, eliminating the need for a driveshaft to the rear axle. Base power for the Grand Caravan came in the form of a 95-hp, 2.2-liter four-cylinder engine, while an optional 3.0-liter, fuel-injected V6 put out a more respectable 140 hp. A five-speed manual shifter came standard, although owners could upgrade to a three-speed automatic. 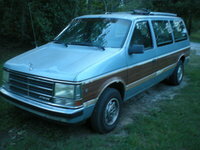 The Grand Caravan borrowed many of its components, both interior and exterior, from Chrysler's K-cars, such as the Plymouth Reliant and Dodge Aires. This included the modified suspension, with MacPherson struts in the front, as well as the front disc brakes and rack-and-pinion steering. Inside, the instrument gauges, controls, and trim were all lifted from the K-cars, which kept in-house costs down, but also had the benefit of giving the interior a car-like feel, another positive distinguishing feature. Initial trims included the Base, SE, and LE. Front captain's chairs and a second-row three-passenger bench seat came standard, although owners could add a two-passenger third-row seat as an option. When in place, the third-row seat cut dramatically into the Grand Caravan's cargo space, although owners could remove it when they needed more cargo room. A single manually operated sliding door on the passenger side allowed access to the second row, while a rear hatch hinged at the top provided access to the cargo space. In 1988, Dodge added an optional towing package and replaced the base 2.2-liter engine with a larger 100-hp, 2.5-liter four-cylinder powerplant. A year later, a somewhat controversial turbocharged version of the 2.5-liter engine, generating 150 hp, was offered as an option, but noticeable turbo lag made the engine relatively unpopular, except with a few enthusiasts who enjoyed tuning the engine for maximum performance. By 1990, it was available only in the shorter-wheelbase Caravan. However, Dodge added a new optional 150-hp, 3.3-liter V6 that same year. 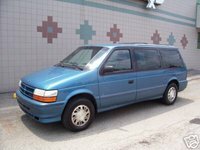 By the time the second-generation Grand Caravan debuted in 1991, the minivan segment had become competitive and crowded, with entries from Ford, Toyota, and GM. 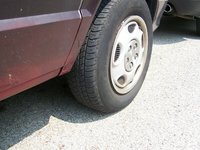 As a result, Dodge took a conservative design approach, stretching the Grand Caravan's wheelbase just 0.3 inches, to 119.3 inches, while overall length stretched to 192.8. 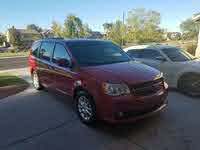 Dodge continued to outfit the Grand Caravan with components from the K-cars, including the suspension and brakes. 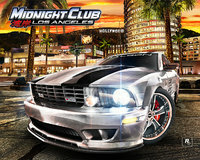 However, the automaker added antilock brakes as an option, as well as optional full-time AWD. Some chassis alterations were required to accommodate the AWD system, however. The powerplants rolled over from the previous year unchanged. Interior improvements for the second generation included new seats, optional captain's chairs for the second row, a full-size glovebox, and additional cupholders, as well as an optional driver's-side airbag. The driver's-side airbag became standard the following year, while dual front airbags became standard in 1994. Dodge also updated the interior design and cloth upholstery in '94, and introduced a new 3.8-liter V6 generating 162 hp. 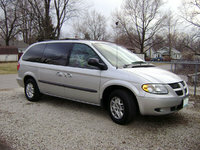 By the end of its second generation, the Caravan/Grand Caravan had sold more than 10 million units. 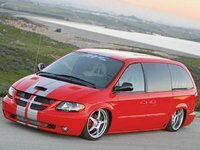 For the third generation, which debuted in 1996, Dodge took a different, more radical approach to the Grand Caravan's exterior design, giving it a sleeker, more sweptback look, with a new front end and a long, more sloping windshield that flowed gracefully into the roofline. Although the suspension was now designed specifically for the Grand Caravan, it retained essentially the same components. The wheelbase remained at 119.3 inches, but overall length was stretched to 199.7 inches, an increase of 6.9 inches. Power came from a variety of engines, including a new 150-hp, DOHC, 2.4-liter four-cylinder, which replaced the old base powerplant, as well as a 150-hp, 3.3-liter V6 and a 162-hp, 3.8-liter V6. New features for the third generation included an optional driver's-side door, which would eventually become standard, and new Easy Out Roller Seats in the rear, which were easier to position and remove. 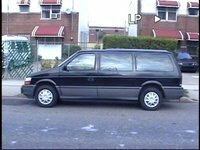 The third-generation Caravan/Grand Caravan was named the North American Car of the Year in '96, as well as Motor Trend's Car of the Year, and earned itself a spot on Car and Driver's 10 Best list in '96 and '97. 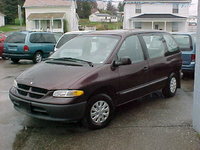 For the Grand Caravan's 15th anniversary in 1999, Dodge rolled out a Platinum Edition, which included unique Platinum Metallic exterior paint and special badging. 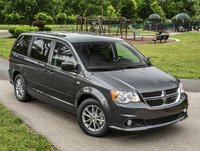 With sales of the Grand Caravan lagging into the new millennium, Dodge elected to again pursue a conservative approach when it came to the design of its four-generation minivans, which debuted in 2001. Exterior updates were minimal, but included smoother, more aerodynamic lines, larger headlights, revised taillights, and an optional power liftgate, as well as optional power-sliding doors. The automaker boosted power for the 3.3-liter V6 to 180 hp and for the 3.8-liter V6 to 215 hp. Handling improved, due to an updated chassis and suspension, although the basic configuration remained the same. Overall length for the Grand Caravan, which now sat on a larger RS platform, measured 200.5 inches, an increase of 0.8 inches, while width increased by 1.8 inches, to 78.6 inches, resulting in more interior space. The wheelbase remained the same at 119.3 inches. Fourth-generation trim levels included the SE, Sport, ES, and EX, as well as the Sport AWD and the ES AWD trims. Interior improvements included a redesigned dashboard, new instrument gauges, and new controls, as well as an available in-dash CD changer and optional side-impact airbags for front-seat passengers. A removable center console could be placed between the front- or second-row seats. For extra storage in the cargo area, Dodge added a pop-up bin with a center divider. In 2002, Dodge offered two value trims, the eX and eL, as well as an optional DVD system and an optional rear-seat audio system, while an Anniversary Edition in 2004 included two-tone leather upholstery. Stow n' Go second-row seats became an option in 2005. However, to accommodate the fold-in-the-floor seats, Dodge discontinued the AWD system. 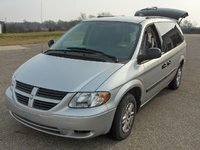 For the fifth generation, which debuted in 2008, Dodge dropped the shorter-wheelbase Caravan from the lineup, leaving the Grand Caravan to continue on its own. The wheelbase grew to 121.2 inches, while overall length was stretched as well, to 202.5 inches. 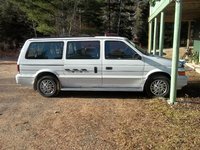 Outside, the clean, simple lines remained, though edges and angles along the hood and sides were a bit more creased, giving the minivan a slightly leaner, sportier appearance. Trims included the SE and SXT, each powered by a different engine. The 175-hp, 3.3-liter V6 driving the SE left it feeling underpowered at times, according to owners and reviewers, while the SXT's 197-hp, 3.8-liter V6 did a better job at moving the Grand Caravan along. Dodge also added a new optional 251-hp, 4.0-liter V6 engine to the lineup of powerplants. Electronic stability control became standard in '08, and Swivel 'n Go second-row seats, which swiveled around to face the third-row seat, became an option, along with Stow n' Go seats. The Grand Caravan's mid-generation refresh in 2011 was fairly extensive, which means trims from earlier in the generation (2008-'10) should be available at affordable prices. 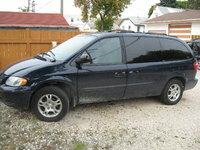 Over the past few years, the Grand Caravan has posted only mediocre reliability numbers from J.D. Power and Associates, which prospective buyers should keep in mind. 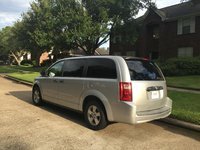 However, the '09 Grand Caravan came with a lifetime powertrain warranty, which might sway buyers toward trims built in that year. While build quality and reliability issues remain murky for the Grand Caravan, it has always excelled as a versatile vehicle with ample cargo space, making it a good choice for families. Trims equipped with Stow 'n Go and Swivel 'n Go seating add to that versatility, although some owners find the Stow 'n' Go seats uncomfortable. The Grand Caravan also performs well in safety tests, earning five stars in all categories except rollover (four out of five stars) from the NHTSA. Owners from northern climes who seek optimal stability will want to look for trims built after 2008, when electronic stability control became standard, or before 2005, when Dodge offered AWD as an option on certain trims. Those who seek upscale features will want to look at such trims as the SXT (early fifth generation) or ES/EX (fourth generation), while those on a budget will want to look at entry-level or early-model trims, as well as the eX and eL trims from the fourth generation. 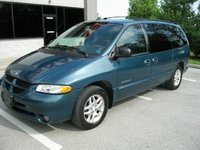 Finally, when shopping for Grand Caravans, buyers should remember it shared most of its features with the shorter-wheelbase Caravan, produced until the 2007 model year, as well as the more upscale Chrysler Town & Country and the mid-level Plymouth Voyager, which could expand options for prospective buyers. My OBD2 wont communicate with scanner.